iNFHRA is an industry body that epitomises the interests of industry and trade, interfaces with Government on policy issues and interacts with counterpart international partners to promote bilateral issues. iNFHRA aims at representing on all national and local bodies to be able to convey industry viewpoints, as also communicate and debate issues relating to public-private partnerships for economic development. 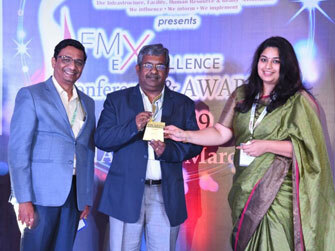 The FM Excellence Awards are known to be the ‘best of the best’ within the facility management sphere. The awards are part of the Infrastructure, Facility, Human Resource and Realty Association (iNFHRA) which enables government and industry bodies to deliberate on policy issues and interact with international partners to promote the globalization and economic development of the Indian industry. 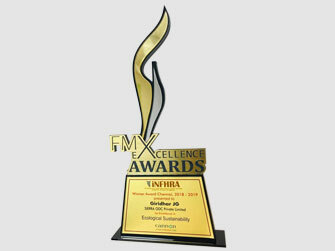 SIERRA submitted nomination for ‘iNFHRA FM Excellence Awards’ under the nomination category ‘Ecological Sustainability’. Awards for 2018-2019 are supported by major IPC's CBRE South Asia, Cushman & Wakefield, Colliers International, Jones Lang LaSalle and Knight Frank India Pvt Ltd as Outreach partners. The Award was received by Mr. David Raja P, Head – Global Client Services, at a function held at Accord Metropolitan Hotel, Chennai.